Original 1910 KNIL propaganda poster to reqruit soldiers to fight in the Aceh war. 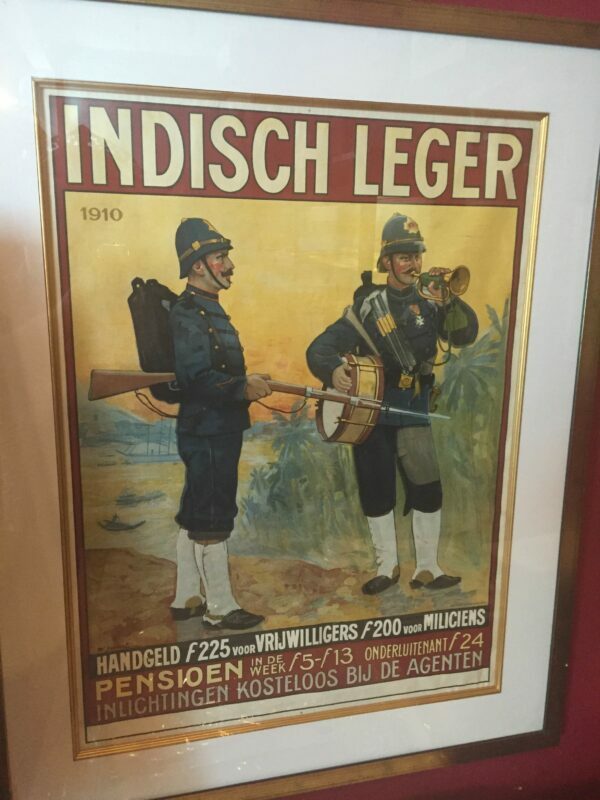 Handgeld f225 voor Vrijwilligers f200 voor Miliciens. Pensioen in de week f5-f13 onderluitenant f24. Inlichtingen kosteloos bij de agenten. The Aceh War, also known as the Dutch War or the Infidel War (1873–1914), was an armed military conflict between the Sultanate of Aceh and the Netherlands which was triggered by discussions between representatives of Aceh and the United Kingdom in Singapore during early 1873.The war was part of a series of conflicts in the late 19th century that consolidated Dutch rule over modern-day Indonesia. Good condition, one small tear repaired on the top right, measures: 65,5 x 83 cm.